I found one coherent diode module. Inside is Spectra Physics part number 0129-2653. Would like to test it to see if is working . Is it possible to connect this directly to DC power supply? This is a laser fiber ? infrared ? Will go down to my workshop to connect to lab power supply to see if is possible to light it up. I'm not sure if that's the "sticker power" or not. If so, the output is a few watts, not 40. 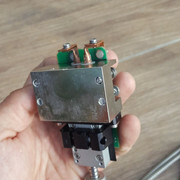 The relay is likely there to short the input (for electrical damage protection), so you will probably need to power the relay before the laser diode(s) will accept a voltage larger than zero. Disassembling it further may provide some clues. It will not lase at 250mA. You'll need several amps. Yes, there is relay in shortcut with diode. With increasing voltage with relay bypased. nothing happend. But I found that if I disconnnect cable to diode, it will lihgt up for a blink of second when cable will be conected back. Looks like it have to get pulsed DC so I made switcihng power supply with pulsed DC at outlet. Both fiber outputs lighted up verry bright when I looked trough mobile phone camera at 1 watts of swithcer supply consuption. Also it is possible to see red light without camera. On 1kHz, was able to draw about 12 Wats from lab power supply. This could be about 10Wats to diode and I guess maybe few wats of light output. At this power it starts to smoke plastic if placed near. I would like to drive this diode to full power if I could get some tech details of it. Interesting that the fiber optic cable is bifurcated. At 797nm +/- 20nm must be a pump for something else. Have you found anything more on this module? It seams, you have to push more than 60 wats to this diode module to get maybe 20 wats of output, I don't know... 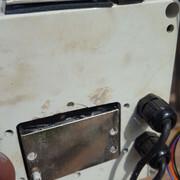 I didn't have time to adjust pump to push more than 10 wats to diode and at 10wats of consumtion(with driver and transformer total pump together) big copper diode metal plate remained cold. This plate was originally mounted to bigger water or peltier cooler. So I assume that it have to consume lot more power. As i don't have any laser power meter, I can only assume output power. 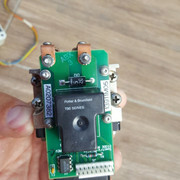 Don't know anything about efficiency of this diode module. Maybe you can assume if beam diameter of 2mm in radius started to melt plastic at 10wats input power.